"A fascinating, deeply moving story... Circle in the Square remains an astonishing chapter in the history of American theatre." "One of the most important leaders of mid-20th century American Theater, Mann has written a thoroughly engaging autobiography." 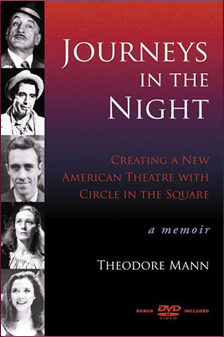 Theodore Mann was a guiding force at Circle in the Square Theatre since its inception Off-Broadway in 1951. The company first triumphed under powerhouse stage director Jose Quintero (a Circle co-founder with Mann), followed by other great directors like: Mike Nichols, Steven Porter and Theodore Mann. Circle in the Square eventually offered up over 175 productions starring luminaries of 20th Century American theatre, including George C. Scott, Colleen Dewhurst, Jason Robards, Geraldine Page, James Earl Jones, Annette Bening, Raul Julia, Al Pacino, Lillian Gish, Salome Jens and many more. In 1972 Circle in the Square moved into its new home on Broadway, where the company proved that it was possible to vibrantly present the classics in repertoire with new plays. GEORGE C. SCOTT, VANESSA REDGRAVE, DUSTIN HOFFMAN, et al.